The sky lightened as dawn approached. The outline of the ancient temple in front of us became more defined and details in the structure could now be seen clearly. Despite the presence of hundreds of other people, the ambiance grew in awed silence. Sitting at the edge of the moat as the sun rose over Angkor Wat was an experience that I had envisioned in my mind countless times prior to finally arriving in Cambodia. Now that we were here, the idea of rushing through it seemed ludicrous. Many people visit the city of Siem Reap with only a short amount of time to visit the inspiring UNESCO World Heritage Site, the temples of Angkor. 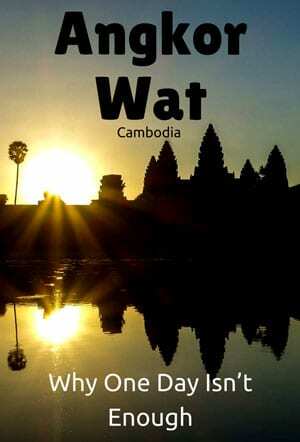 For backpackers the cost of visiting Angkor Wat can be quite high. Most people settle on trying to fit in as many of the sights of Angkor in a single day, to either save time or money. While a few of the most famous temples can be visited in one, long day, to us this just seemed impractical. We opted for the three day pass to explore the time-honoured complex and felt that this was the perfect amount of time. A young Khmer girl standing in front of Angkor Wat. Angkor is one of the most important archaeological sites in all of Southeast Asia. At a size of over 400 square kilometres, Angkor used to be the centre of the Khmer Kingdom. Some of the oldest structures are now over 1000 years old. Today it receives over 2 million visitors every year. Those that visit Siem Reap on a tight schedule usually only visit the more famous sights such as Angkor Wat, Angkor Thom, Bayon and Ta Prohm (featured in the Tomb Raider movie). If you get up for sunrise and stay out for sunset this is a massive and exhausting day. It is almost impossible (but yes you can!) to rent a scooter or motorbike in Siem Reap to explore the temples of Angkor, leaving most people to rent a tuk tuk, taxi or bicycle. To ride around the popular loop is 36.5km (and that doesn’t include the ride out to the temples from Siem Reap). We were lucky that we already had our motorbikes with us, otherwise we would have rented a bicycle for around the main section and a tuk tuk for the other areas. Why Is One Day Not Enough? Inside the complex of Bantea Samre. The weather in Siem Reap is hot. Ridiculously hot. In the winter temperatures will reach 30 degrees celsius. In summer this can be as high as 40. Riding around on a bicycle, climbing temples and walking around the vast complex can be very tiring. Besides the weather and distances around Angkor, there are so many other temples in the region which deserve exploring. Many of these like Banteay Srey, those in the Rolous group and Beng Mealea are in outlying regions meaning you will need an additional day to visit them. One of the most common things you will hear from people is that they are “templed out”. We understand this concept, but don’t agree with it. You may never get the opportunity to visit the temples of Angkor again, so why not make the most of it? If you are a young backpacker, chances are you haven’t been “pubbed out” yet, so enjoy the temples while you can! What it really comes down to is you will probably be tired from exploring as many of the temples in just one day. If you have the time, why not spread it out and enjoy the beautiful attraction over a few days? The overgrown jungle temples at Ta Prohm – made famous in the Tomb Raider movie. We broke up our days by rising early for sunrise on two of the three mornings, and staying out for sunset on two nights. During the hottest part of the day (between 11am and 2pm) we often returned back to our hostel, headed into town for lunch or found a shady temple with a breeze to just kick back and relax for a few hours. Having the time to walk around each and every temple was nice, without having to constantly be looking at our watches. Knowing that if we enjoyed one particular temple for a while we could hang out an extra hour was an incredible luxury to have. If you travel in the wrong season you may not get the clearest skies. It might also rain a lot which can really change your outlook of the incredible sight to become slightly negative. It would be a shame to only have one day and miss out on a beautiful sunrise, only to find out the next day was picture-perfect. The iconic Angkor Wat is very different in the morning for sunrise compared to in the afternoon. Watching the sun break over the stone lotus flowers is something you must see if you are headed to Southeast Asia. Yet when you return later in the day the sun is beaming on its Western face meaning it takes on a whole new image bathed in light. It is also much quieter to walk around without the hordes of people. Banteay Srey has some of the most intricate bas-relief carvings of any of the temples in Angkor and is worth a visit just for these. Be aware that this place is almost 40km north of Ankor Wat and will need its own separate afternoon or day. Beng Mealea is 80km from Siem Reap and will need its own day to reach it if it is something that interests you. Sunset from the top of Phnom Bakhong. The three day pass can be used on any three days over the course of a week. The seven day pass can be used over the course of a month. Tuk Tuk Rental – $15-30, depending on negotiating skills, group size and language skill of the driver. Bicycle Rental – $1-10, depending on quality of bicycle. Free from some accommodation. Have you visited the amazing temples of Angkor? Did you think one day was enough or did you spend more time exploring the ancient ruins? Hello again Lesh and Jazza. I recently saw a blog from around 2012 about a man who had his rental motorcycle impounded by the police because he was riding inside the temple area. It seemed that only locals were allowed to ride there, possibly to protect the tuk tuk tour industry. I was wondering if you had heard of this happening to other tourists or if you had any police encounters on your motorcycles when touring the temples? I will be touring on a motorcycle bought in Vietnam with blue papers and an international drivers permit. As always, thank you for your amazing travel blog! Angkor absolutely needs more than a day. Spending three days is the only way to find the less crowded, more atmospheric temples. If you only have a day, you will end up rushing around the main temples along with the tour groups and their selfie sticks! The three day pass is pretty good value when you consider the huge size of the site. We also went for the three day pass and were so glad we did. I knew that one day wouldn’t be enough and I was right. Trying to see as much as possible in one day with that burning sun blazing down on you would definitely take away from what is an amazing opportunity. We loved the temples but I would love to be able to explore it with our own transport. Our tuk-tuk driver was unfortunately not particularly friendly or accomodating and it was a bit frustrating being restricted to him taking us places as we had spent a lot of time reading about different places to visit. Hopefully we’ll be back – we are yet to see anywhere else in Cambodia and your motorbike tour of he country has inspired me! Shame that your tuk-tuk driver wasn’t friendly. Hopefully the temples made up for it! Glad our motorbike tour could inspire you as well. Happy travels Ruth. I just visited Angkor in June and opted for the one day pass but agree that 3 day pass would have been perfect since I didn’t get to see the outlying temples. Still got to see the sunrise, Angkor Wat, Angkor Thom, Ta Prohm and Banteay Kdei and sunset the day before. So not bad for one day but would have been nice to see the other temples. Weather cooperated too so I got lucky there. Thanks for the article. We’re heading to Siem Reap next week and will definitely use this info! Shame it costs so much to see the temples but it’s definitely worth the money by the looks of it. I totally agree! Many times I meet people that say that one day is plenty and I’m really surprise. Either you rush in an exhausting marathon, either you see just Angkor Wat. There is much more to see then that! I think that the 3 days pass is a good deal. I wouldn’t say that is a waste at all, Dariel! When we were in Bagan we spent almost 2 full hours sitting on the edge of a tall pagoda, listening to the Buddhist chanting in the distance and the birds chirping on neighbouring temples. We had the whole pagoda to ourselves, and it was a magical experience. Still to this day one of the most memorable moments of our trip in Southeast Asia so far. Taking your time to thoroughly explore Angkor is time well spent, in our opinion. Cheers for reading, and happy travels! Agree – we got a 3 day pass as well and spent the first day at Angkor Wat, Angkor Thom and Ta Prohm. The 2nd and 3rd days were spent exploring some of the outlying temples. Pre Rup and Beng Melea were my favourites (Beng Melea is worth the long drive!) and we had them to ourselves, initially at least. It was sweltering while we were there so it was great to get an early start and head back to our hotel (and pool!) around lunchtime. I do agree with Gilles though that a week would probably be even better – I’d be more inclined to take my time rather than cram too much in. But I certainly couldn’t imagine just having one day! I must say that I agree but actually also disagree! What do I mean? Of course one day is simply not enough, it is actually crazy to spend so little time at such an amazing place. But I would actually argue that you need far more than 3 days, especially if you want to cover the more remote and incredible temples further afield like Being Mealea and the Rulous Temples. I think that you need a (small) week. Good post, this is one of the places that I intend to see next time, whenever that may be! One day is enough, if someone is willing to gamble on the weather and only plans to do the small loop. 🙂 I opted for the three-day pass though, so I also cycled the grand loop and visited the Roluos temples. That’s a nice photo from Phnom Bakheng. I didn’t enjoy moshing with the crowds up there (and it was off-season), but we got a better view from one of the platforms halfway down the hill. Completely agree that one day is nowhere near enough! We were there recently and some of our favourites were indeed the ones that are further out, like Banteay Srei and also Neak Pean. They’re all so different from each other, and all worthy of a visit. Arrgggh! Yu two are constantly adding to my collection of places I simply have to take my daughters to when we head to Asia later in 2015! Thanks!!! Haha, we try to inspire, Jane. Glad it is working. Your daughters will love it there!